We're now running a new series of contest on our Joyetech Social. To be specific, you're invited to do a full review (written) of our certain product. We'll then choose some of the great reviews and let you guys vote for the final winner. As a reward, he/she will get a free device. So, as for the first time, we're focusing on the Joyetech eVic Basic and its upgradeable firmware. Duration for this contest, from now on till Oct. 9. (09-25-2016, 11:11 AM)chasea91 Wrote: Ok so the Evic Basic by Joyetech is one awesome little device! Especially when paired with the Joyetech Cubis Pro Mini that it is sometimes paired with. It is a small, light device that can fit easily into the palm of your hand. It comes in a variety of colors including: Red, SS, Black, Orange, Blue, and White! This device can reach up to 40 watts in wattage and temp mode and can go to 60 watts when the upgrade has been downloaded onto the device, or if you would like, you can use the bypass mode, which is like a mechanical mode. Also with the upgrade, you can use the preheat function which allows the user to customize each and every vape. The Evic Basic has temp control function for Nickel, Titanium, and Stainless Steel 316, and you can adjust the wattage for each by navigating thru the interface menu. This device also has TCR mode which has 3 different memory settings so you can customize up to 3 different profiles depending on what type of wire is being used. A new Logo mode is installed on the interface which can be turned on or off, and the device has a long list of safety and protection features which puts this device above others in the market. 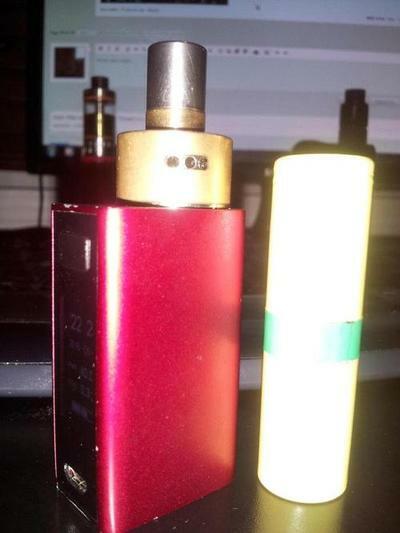 Also it has a RTC (Real Time Clock), which is a very handy feature to have on your vaping device! The battery life on this beautiful device is 1500 mah, which is perfect for the small size and has plenty of power! This little device really has it all and is perfect for the beginning vaper or the advanced vaper. I personally love this device! I have an orange evic basic and it goes everywhere with me! And I mean literally everywhere, including the bed! I really like this device because it has many features and it small in size with long battery life, and is very easy to use and depend on when I need a vape! Everytime I go out, or if I am just at the house, you can always bet my evic basic will be right by my side just like a sidekick! Love this little thing! Looks like Joyetech has done it again! In Italia siamo molto contenti dei prodotti della joyetec. Io ho un aio, una cubis con cuboid e una minievic con ultimo. Adesso ho comprato la nanao...bellissima, da passeggio svapo a 35 watt con grande aroma e tante nuvole!!! Il firmware joyetech è una bomba!!! Lo spunto è rapido e tutta potenza arriva in un attimo. Continuate così, siete numeri uno. (10-12-2016, 05:34 AM)chasea91 Wrote: When is the winner for this picked Kermit? (09-29-2016, 02:23 AM)Marco Ferraro Wrote: In Italia siamo molto contenti dei prodotti della joyetec. Io ho un aio, una cubis con cuboid e una minievic con ultimo. Thank you. Maybe next time, you can try English so that we can understand. Thank you for the kind suggestion. Actually we mainly want to make a really small mod for daily use. So battery would have to make a sacrifice. Finally the winner goes to Ken Ka. Congratulates. (10-12-2016, 11:39 AM)Kermit Wrote: Finally the winner goes to Ken Ka. Congratulates. Woohoo! Thanks for the contest! Sent you an email ! Curious though what did I win lols! Congratulates Ken Ka. Here I must note that, the review contest is open to everyone. But if you think that your review is better than the winner, prove it with your illustrations. Don't trick me with some copied stuff from internet. It's useless. Show some respect to the winner. Think about why he/she won it. No pains no gains.